Explore the forests at Circle Creek and observe the wide variety of fungi found in them on an afternoon walk with NCLC Land Steward Eric Owen. We will investigate what roles different mushrooms undertake in their respective environments and how they interact with their fellow inhabitants. ERIC OWEN completed his bachelor’s degree at Oregon State University in 2014, having majored in environmental science with a minor in writing. 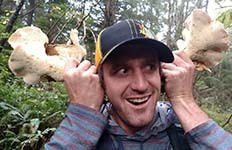 In addition to his passion for conservation ecology, his interests include mycology and mushroom hunting, soccer, surfing, playing music, and brewing beer. Eric was born in Grand Junction, Colorado, grew up in San Diego, and lived in northern California for several years before moving to Oregon in 2010 to be nearer to his immediate family, who all live in the state. He lives in Warrenton. Outing info: This mycology-focused hike will follow one or more of the trails at Circle Creek with uneven terrain and easy to moderate difficulty. We will be meandering at a relatively slow pace, but rain boots or waterproof hiking boots are strongly recommended, as we may have to traverse through mud and/or up short inclines. No toilets on site. No dogs allowed on site. What to bring: Water and snacks. Wear waterproof boots or sturdy walking shoes and dress for the day’s weather. Bring a hand lens or magnifying glass if you have one; otherwise one will be provided.